Flamborough Pre-school is a long-established committee run setting. We are dedicated to encourage every child in becoming a happy, confident and enthusiastic learner through their own exploration and play in a safe and stimulating environment. As parents and carers you are your child's first educators and we strongly believe that by working in partnership with you we can provide the best possible early education for your child. We understand that all children have their own interests and learn in different ways, therefore we provide a wide variety of resources and activities to meet every child's needs. Our setting has a strong focus on learning through play, we understand that play helps young children to learn and develop through doing and talking which has been proven to be the way children think. By encouraging this early form of learning, strong foundations can be built which support children's learning as they grow and develop. At Flamborough Pre-school we promote British Values, embedding them into activities and routines. We provide funded early education for 2-4 year old children, as well as places for fee-paying children. Please contact us to arrange your welcome visit where you and your child can meet our friendly team of qualified practitioners as well as explore the setting and ask any questions you may have. Children enjoy a variety of arts and crafts activities. They are all encouraged to become involved and explore a variety of resources. Outdoor play is particularly beneficial for children and we spend as much time as possible in the Pre- school garden whatever the weather! 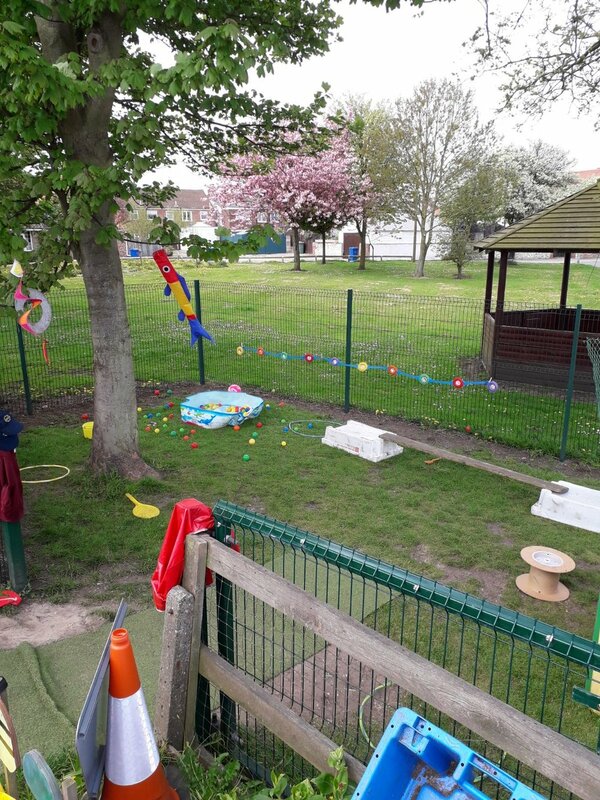 At Flamborough Pre-school we use the EYFS guidance to help plan and provide a range of play activities which help children to make progress in all areas of their development. We believe that by promoting the three key themes of the EYFS, children are supported to reach their full potential. . At Flamborough Pre-school your child will be learning through play in an Enabling Environment, accessing a wide range of activities and stimulating resources to suit their individual needs. You will be allocated a key person who will work closely with you and your child to form a Positive Relationship. This will enable your child to feel more confident in their learning environment. We recognise that every child is A Unique Child, and support each of them to become resilient learners with a positive sense of self through valuing and respecting each of them as individuals. Sensory exploration is important for all children to learn about the world around them, as well as promoting language and imagination development. The EYFS is split into 7 areas of learning, 3 prime areas and 4 specific areas. At Flamborough Pre-school we plan a curriculum which supports every child to develop in each of these areas. All children are supported to form good relationships with staff and peers and have a positive sense of themselves. They are encouraged to make their own choices and express their own interests. We promote positive behaviour, with all children being supported to learn boundaries within the setting, develop sharing and turn taking skills and learn to manage their own feelings and behaviour at an age appropriate level. Children are given opportunities to develop their language skills through every routine and activity at Pre-school. We encourage children to use language to express their own thoughts and ideas as well as developing their listening and attention skills. Children are provided with a range of activities which promote their physical development. We have a variety of large play equipment on offer at the setting which helps children to develop their large motor movements, balance and co-ordination. We encourage a healthy lifestyle. Supporting children to become independent in self- care routines such as hand washing and have a variety of fresh fruit and vegetables available at snack times which children help to prepare. Our reading corner is cosy and inviting to encourage children to enjoy books independently and with adults. We have circle and singing and rhyme times every session which support children to develop their early literacy skills. Children's mathematical skills are developed through a variety of activities in the setting. Early counting and number recognition skills are promoted through play which allows children to learn in their own way and at their own pace. Children are guided to explore the world around them and use their senses to discover their surroundings. We take the children on regular outings in and around the community where they have opportunities to explore and observe people and places around them. We provide a wide variety of technological toys including cameras, tablets, computers and torches. Children explore and experiment with a range of exciting resources that encourage and ignite their creativity. They are supported to have their own ideas and become imaginative in play situations. Pre-school closes for half term. Pre-school reopens after half term. Pre-school closes for Easter Holidays . Pre-school opens for Summer Term . Pre-school closes for half term . Pre-school reopens after half term . Pre-school closes for Summer Holidays . We offer government funded places for children aged 2-4. All children are entitled to 15 hours funding from the term after their 3rd birthday. Some 3 and 4 year old children with working families are eligible for 30 hours government funding. In addition to this, some children may be entitled to 15 hours funding from the term after their 2nd birthday. You can perform an eligibility check for funding here. We are also enrolled on the government ‘Tax Free Childcare’ scheme, which enables eligible fee-paying families to claim 20% of their fees from the government. If you wish to contact us, please complete the form below and we will reply back to you at the earliest convenience. Thank you! We will reply back to you at the earliest convenience. 2019© Flamborough Pre School - All Rights Reserved.